The last four weeks with Crystal have been full of amazing inspiration, excellent tips and awesome cards. Crystal is such a delight! I feel so very blessed Crystal shared her talents with us this month! If you missed her smashing debut you must see it...CLICK HERE or her bright, fresh and sensational second performance CLICK HERE or her graphic and modern triumphant third performance CLICK HERE! Lucky for us all we have her final command performance today and she will be joining us next week for our June 2017 Release (be sure to join us beginning Monday, June 26th). 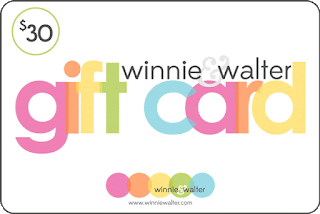 Hello crafty friends, Crystal here with my last post as Winnie & Walter's June Leading Lady. As my last performance I have a very bright card using the fabulous new Cutaways released this Spring. 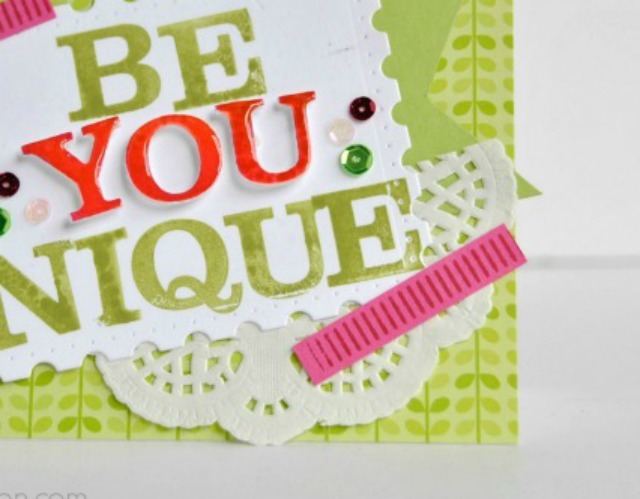 To make this card, I started with the bright green patterned paper. Next, I trimmed the solid green card stock and hand cut the end pieces to resemble a ribbon. I then added a white paper doily cut in half. To layer on top, I die cut the white card stock using Essentials: Lana Cutaway. 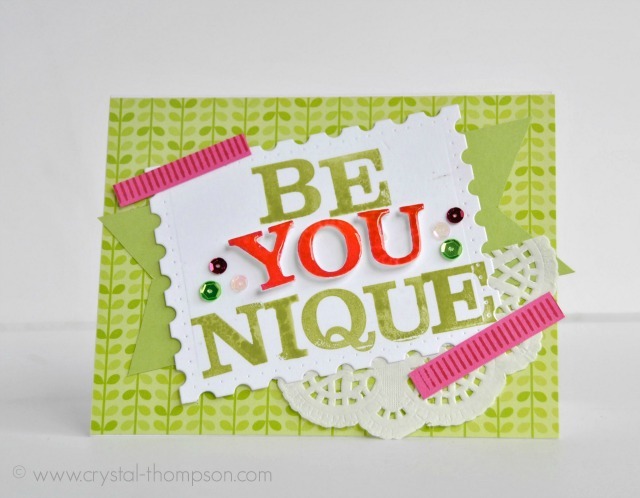 Using a matching green ink, I stamped the BE and NIQUE from Typecast: Cary Letters. The YOU is stamped in Typecast: Cary Letters and die cut with Typecast: Cary Letters Cutaways, then adhered to the white die cut with foam adhesive to give the card dimension. Once that was all glued down, I added two ribbons of hot pink paper stamped with Scenery: Stripes 2 in a darker pink, then trimmed down. To finish off, the YOU is covered in Glossy Accents and added a few matching sequins. This card ended up being very bright and happy. I have had a great time spending my Saturday's here on the Winnie & Walter Blog. 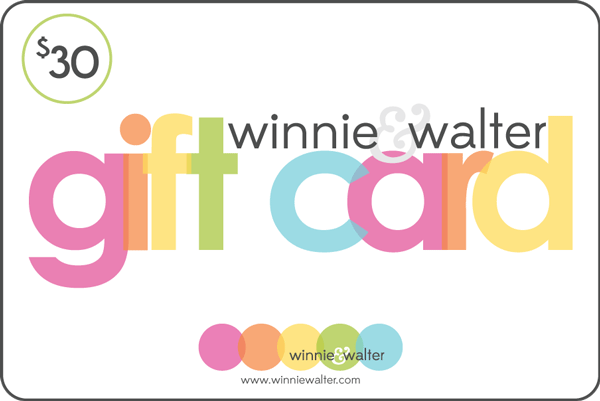 Don't forget to comment on my blog post for a chance to win the $30 gift certificate to the Winnie & Walter store. Winner will be announced on my blog, Monday June 26th at 10am PST. Love this pretty color combo! Such a fun and happy card!! I'm loving the wonky YOU and the carefree, informal look. 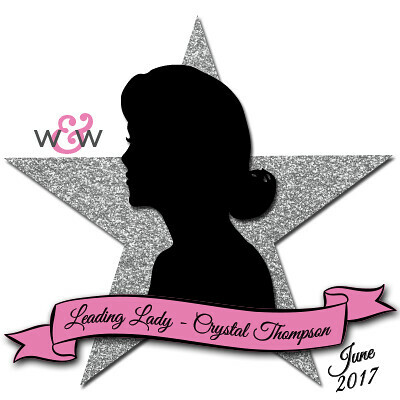 So glad that Crystal will be joining in the New Release festivities next week!! Yay!! 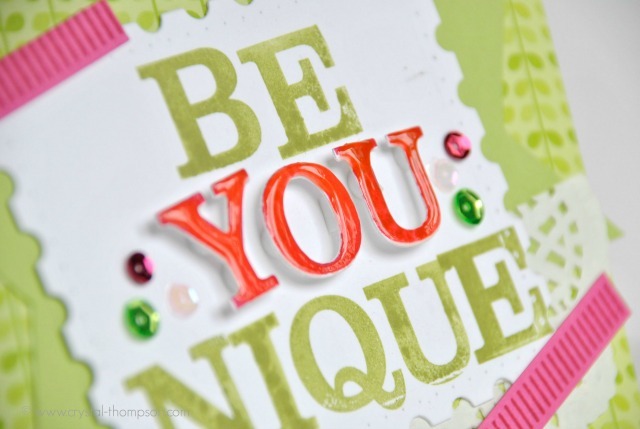 Lovely mix of elements & love the look of the word with the GA! Very creative. Love the colors. Such a clever play on words. The red. YOU really jumps at you. beautiful card :) love the play on words, very clever! Loving the free and easy design of this, and the bright cheery colors! Summer projects just call for whimsy and color and this hits it out of the park! That postage stamp edged die is one that I was eyeing in the W&W shop as well. Thanks for sharing your pretty cards with us this month! Very creative! Love the cutaways! Great design and I like the fun bright colors. Great use of the die-cut letters! Love the green with splashes of colour! Such a lovely card with refreshing colors!